Okay trying to figure out how the whole things works and where to post what! Some things will be posted on my blog and also in Flickr, some just in Flickr which I am trying out just for this! Right now can not figure out how to post photos, ugh! Okay I'm back and think I have it figured out! This is a page kit from 2011, embellish it! It fits a few challenges! Here is my page for 28-4-28 Day NINE: Tone on Tone. I also wanted to take on the horoscope challenge. Still playing with some old Holland America photos. This one from 2010.
angel97701, if you can link ALL your takes on the challenges in this thread, and add up your points for each creation in the same post, that meets the sharing point. If you are taking on a 28-4-28 challenge, then please link your page in the specific challenge there. No need to talk about points in a 28-4-28 challenge post. I am going to link your pages from Flickr to here. If you PM me, I can walk you through the steps to link from there. jeremysgirl , that page with the buttons and the stitching is GORGEOUS! Love the colours, the group photo and those camping images. It all went together perfectly! The Dream page is wonderful, too. 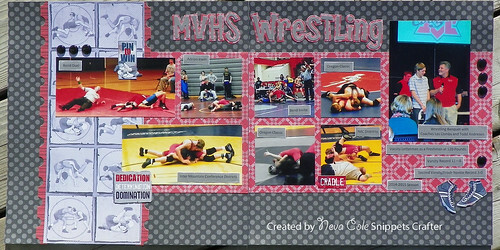 Love how you used red and how you layered the mats. He looks like his dream has just come true! KelleeM , that Funny face page is SO cute! The photo is sweet and I love the pink & purple colour scheme. Great use of the large banners with the script pp. And the two pager is delightful with the photos at the centre, leaving lots of room for the summery scene. Love how the branch overlaps the photo. elaynef, that camping two pager is really cool! I love the arrow and canoe icons and that camping plaid. And the Munchkin page is so artsy! Such a contrast. Love the blues & greens, the scattering of hearts, and the bit of sparkle. kitbop and angel97701 I have left you love in the Gallery. I love that you are scrapping all of the details, dasmith2, and that you took photos to back up your journaling. I really like your distressd floral background here, and the pretty flower and butterfly embellishments. kitbop I love your page! Beautiful colors! Wow, you are the most prolific scrappers. I leave the board for 3 days and I am at least a full page behind on enjoying your projects. 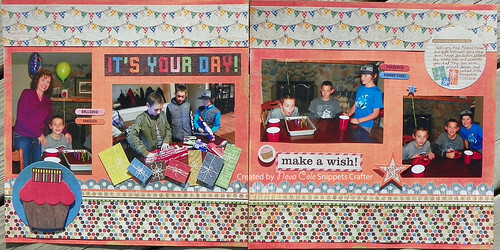 This is for 28-4-28 day 8, which was pretty easy because I could scraplift myself. I'm hoping to get some scrapping and chatting time a little later. We have a big 4-H Banquet tonight out of town, so scrapping may have to take a backseat. This is for the Tone on Tone 28-4-28 challenge. I have boys who are very active in sports, and a husband who also loves the outdoors. I rarely have a chance to do a girly girl layout, so digging out my stash of Prima flowers and finding tone on tone colors to add to this layout was super fun an satisfying! The DYI Thickers are covered with seed pearl beads, something that I was encouraged to do because of these challenges! I've hoarded the DYI Thickers for several years since purchasing them and finally used a few! Even found a slide mount from ages ago to complement the layout. Since the photos are of a white dress in a mostly white background of a tub and room, using tone on tone really makes the layout shine. I am super pleased with the final product! OK, this is for the Day 4 take three challenge. 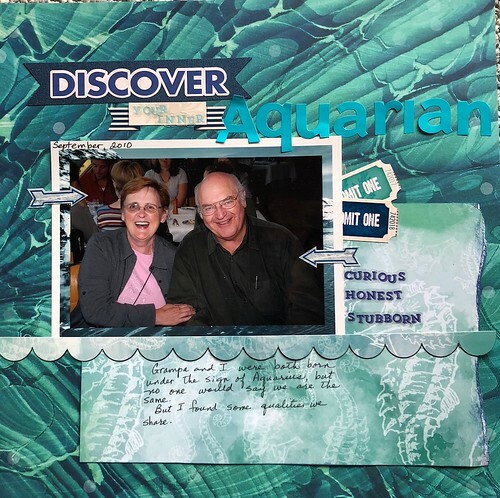 craftymom101, I love your black and white stripes on the Aquarium page. You use of the big tropical leaves really lead the eye to your photos. Great job on the journaling. That glittery title is perfect. dasmith2, that is the most wonderful wedding invitation page. I love the soft colors and the inked edges. The lace around the sentiment is so pretty. Love the wildlife silhouettes. Fabulous job. jeremysgirl, your prom pages are beautiful. I love the color of her dress. 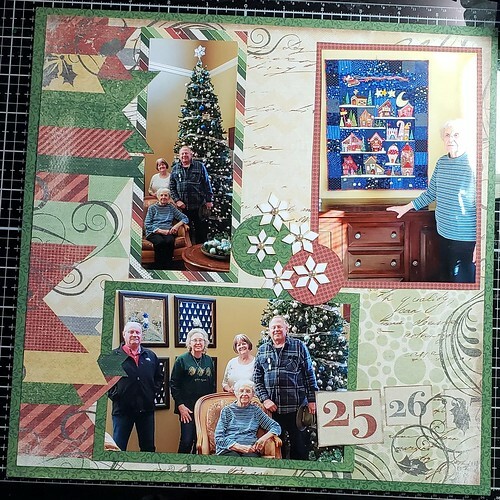 That floral paper has all the colors from your entire layout and pulls everything together perfectly. Love the jeweled flourish in the corner. Such cute kids!! I love your adventure page. The stitching is wonderful. I love the way you take your paper and embellishment colors from the photos. This is such a great page. KelleeM, you have the cutest photos of that little gal. Her Funny Face is totally delightful. How I miss having little ones around! I love the banners as the background and your glittery flowers. Beautiful! I love the fun with friends page. I think I want to scraplift it. I have those same stickers and you have used them so well. Love it all. Hope to catch up the rest later. nylene...my granddaughter is in the 12 by 12 pages...the 8 1/2 by 11 s are my daughter when she was little! This page is for Day 5 color tic-tac-toe. I went with blue, turquoise, and yellow (+pink). This page is for Day 3 this and that. Thank you thank you THANKYOU for sharing your baby pages, myboysnme ! I am soooo jealous! Beautiful pages, thracian . So glad you came to play! I will leave specific comments in the challenge threads. Another layout, this one for Day 1 scraplift challenge. My very long post from last night has somehow disappeared. (SIGH) I will try again. elaynef - I finally zoomed in on some of your work so I could see it better & boy am I glad I did. I love everything about your Muchkinland LO- especially the "art work" & the border. The photo mat layers on "Sparkle" really set off the phot. I like the flow on your paddle board LO & love the colors. jeremysgirl - Great lift. I love everything about this LO. Makes me wish I had taken pics of my DH when he got his Dream truck. dasmith2 - What a pretty LO of an unexpected wedding plan. These are the things I love to see in a scrapbook. myboysnme - I miss you this month! (&I wish you were on my team. LOL) Your DGD is so cute! Isn't it fun to have a girl to scrap? thracian - Your LOs are so femininie & pretty. I like your style. The duck lake is a fun LO to have. Probably something you may not remember in future years. It will be fun to look back on. These are my submissions for 28-4-28 Challenges #3 & #11. These are our "quiet moments" of Christmas before all the fun & chaos that our kids & g13 grandkids bless us with. My DH & I celebrate "Christmas Adam" on the 23rd, where we calmly reflect on the meaning of Christmas & open our gifts to each other. This is a photo of my DH reading the Christmas story from the book of Luke. Something we have done for 46 years. The second photos are visiting my MIL at her retirement home. Here are a couple more from me. patin, I think those are my favorite pages of yours...I think I have said that a couple of other times too. I love your style! Love in the gallery, my friend. elaynef, I love your Munchkin layout. I recognize the flower and droplets from long ago papers. 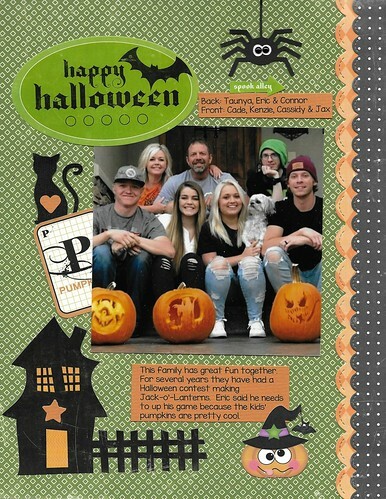 They look perfect on this page. The mats at angles on Your Sparkle is a great touch. I want to scraplift if I can leave them tilted. You know how hard it is for me to tilt things. I love the tilted look. ~Great job with the 6x6 papers. The journaling on vellum is a great idea. jeremysgirl, I think there is nothing happier than a man with a new TRUCK. The men in my family love their trucks. This is a great layout. Beautiful layering and I love the tied paper. 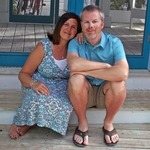 dasmith2, I love your wedding planning and finances layout. I especially love that you wrote things on a paper plate. That is soooo us! Just makes me smile! Great job. myboysnme, I love those darling baby pages. How I miss tiny ones around here. We are expecting a great-granddaughter in the Spring. I can’t wait to scrap baby photos again. Fabulous job on these pages. @thacian, I love the background paper on your Love This page. Did you do the stenciling on it. It is so pretty. I love your layers and the tucked in journaling at the top. Beautiful. I love your colors on the Duck Lake page. You have a real knack with color. Love your style! ~ Your Lifetime Friend page is so full of warmth. Another beautiful page. elaynef, how sweet to include a family photo and a quote on your birthday cards. I like how your dd's card has that asian flair. And you say you aren't a card maker?! I think these prove otherwise! Way to use up old supplies too on The Actor Always looking for a costume!! The paper is perfect. I like the bottom banner you made. Artesian Well and Pool is equally as pretty. Those photos of nature are amazing. I wish I had your eye and skill for nature shots. Our Vacation: I like the little bits you added like the tag with twine and the ribbon and "The Big Apple" on the apple die cut. We Went to Geronimo Creek: Great photos, but I love how you made the facing page about the kids vacation from their parents. 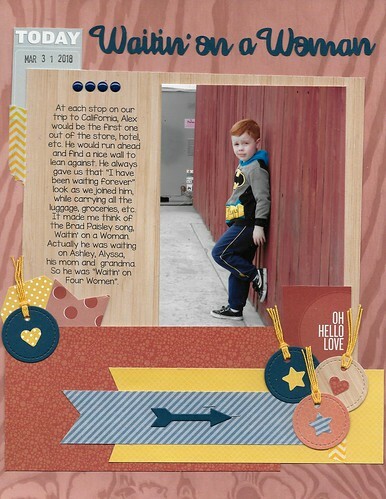 Legoland: Great patterns and colors for this page. I like the use of the buttons to move your eye around the page and your banner. Paddle Board: great pages. Like the frame work on the first page and how you were able to get so many on the second and still have room to rest your eyes. Mayor of Munchkin and You and him: Love both of these pages. Everything about them. craftymom101, Thanks Cards: Both are so pretty with such vibrant colors. Florida Aquarium: Such a dramatic page. I like how you cluster the elements together letting the striped paper show more. And your clustering and layering is fantastic. AussieMeg, Nylene's lift page: fantastic job. I love the little bits and bobs you added around the speech bubbles. 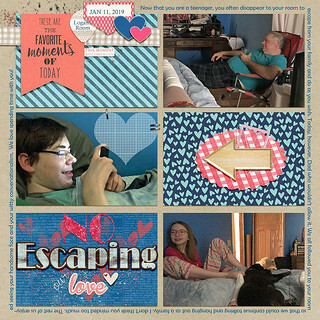 jeremysgirl, Being with my Sister: You captured that happiness and love right on the page. (I love being with my sister too). I may have to lift this. The One I Love: the astrological love journaling is so cool. I love the colors and stars you chose to emphasize the theme. Day 9 Fancy & fabulous: awe, such a sweet layout that I'm sure will be cherished. I love that floral you used. Day 6 Adventure: ohh, I'm loving the colors and the buttons and the stitching and well everything. Day 7 Dreams: Beautiful page. I love the colors you used they have a striking yet well balanced look. 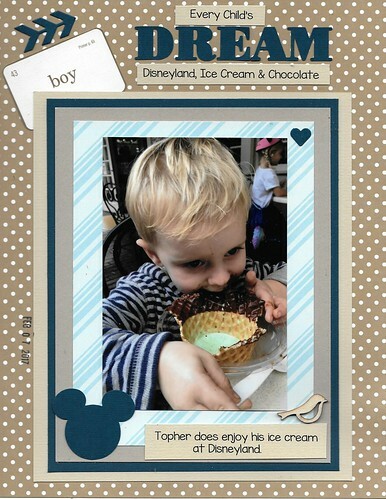 patin, Magic Kingdom: Really liking your homemade pattern paper and use of and placement of photos on this layout. Thank you for your Generosity Card: Like the purple, really pretty card and now I have to go find out about this Distress Monoprinting. Christmas: Love the whole Christmas "Adam". Your pages are beautiful. I love the little white "poinsetta" you made and use of buttons. KelleeM, Love: LOVE!! All those hearts and your dd's sweet face. Perfection. Superfun: great use of color to create a page with energy and happiness. Meg is One: So Sweet! the page has a softness that just reminds you of babyhood. Fun with Friends; Fabulous page. It really captures the outdoors with the embellishments. 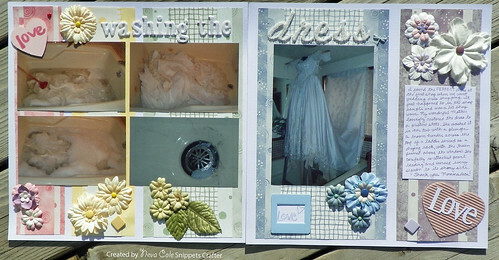 dasmith2, Hold on to whtat keeps you warm: Love your wedding invite and this page that will keep it. Just love everything about it. Planning: very pretty page. I love that you took photos of your notes to include on the page. kitbop, Be a Flamingo: Your addition to that quote is the best, that's totally more like me. I love the dark blue banner and the layered cluster on it and your colors. Our New Spot: This page has a feel of being sunbleached to me. So perfect. You've been scrapping summer water photos, are you a bit sick of winter over there? This Noise is Ninja Approved: I like the scallop top border, the angle of the paper that adds so much energy to the page, and the photo cluster. grammadee, This is My Year: Love! I love the die cuts and the borderstrip and the little lace flower, and how it's all in red and of course, your beautiful photo. Such a stunning layout. Aquarian: LOL: too funny. I love the page and the photo. angel97701, It's Your Day! Great double pager. Love your presents border. A band composition is one of my go to ones. Washing the dress: Great tone on tone work. MVHS Wrestling: Great page design and title work. I love the masculine feel to the page. myboysnme, She's beautiful. I bet you are one happy Grandma! The pages are just stunning too! 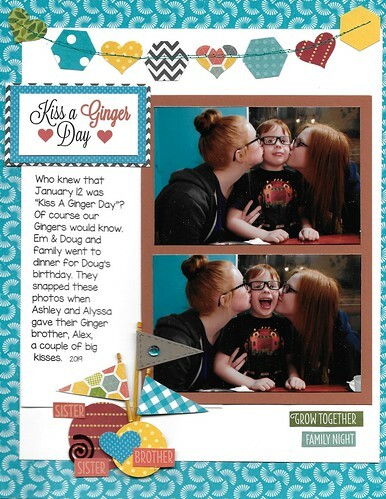 nylene, Kiss a Ginger Day: Oh, my! Such complete Adorableness!! and the page too. Halloween: Fabulous. 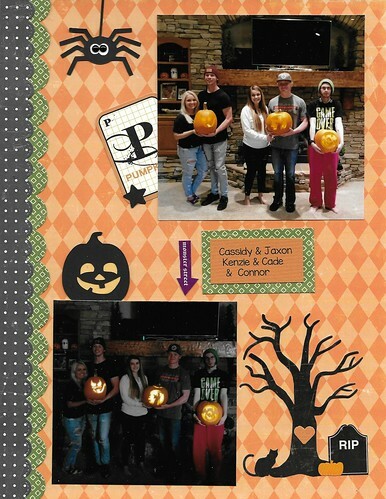 I think I'll have to send our pumpkin photos to you to scrapbook for me. thracian, Day 4 3 challege: Great color scheme and fantastic layering. Day 5 Hello Duck Lake: You Rock color schemes and layers. Another fab page. Day 3: lol I love the "my soulmate is carbs", I need that for a page for my DH. Lovely page. Day 1: Lifetime Friend: gorgeous. Fabulous word art piece and everything is just so perfect. I had time to play a bit during the last 3 days, so here are my 2 layouts. My niece sent me this photo of her kids playing in "so much snow". LOL! They live in Texas. They had some freezing rain that a bit accumulated at the bottom of the slide. This is about our teen son who tries to escape his family but we wouldn't let him and swarmed his room to hang out and talk. 28-4-28 days 10, 11, & 6.
thank you for all the nice comments on my stuff! You all are so encouraging. I've always felt that scrapbooking is art and you all have reinforced that the last few weeks with all the beautiful work. I'm calling these Stitch challenge and single photo challenge. I stitch 99% of my memorabilia pockets with the sewing machine. I started doing that when I didn't have any glue that would hold them and I find it so easy, I've kept that habit. The single photo I tried to do the tone on tone challenge, but didn't get good results so I started over and found this gingham paper that reminded me of Dorothy's dress. There were several little girls who had on their Dorothy costumes at the play and were getting their photos taken with her. LisaDV , your cute pages have love left in the gallery. This is for 28-4-28 Day 7 to use the word Dream. #2 Leave 5 comments, #3 28-4-28 Day 7, #4 Hearts, #5 Love little Topher, #11 2 font title, #12 Date stamp, #14 Stars, #18 Hoarded Flash Cards 2012, #20 8x8 pad#22 Dies & Silhouette, #29 Preprinted Boy, #40 Arrow, #41 Rectangle page, #43 Chocolate mud, #45 Computer journal & title, #47 Single Page, one page completed and posted.=18 pts. elaynef, those Wizard of Oz pages are great. I love the photo of being in make-up and the fun paperclips. The companion Cast page is really cool with the index card shape behind the photo and use of buttons. I’m glad you added the tickets to it also. I posted my Storm Force Accelatron Layout in the Flickr group. How can I post it here, using my phone? SO...This is a cool LO! Love the slightly overlapped photos, and those are some awesome back papers! That dragonfly is gorgeous! #40 Arrow, #41 Rectangle page, #45 Computer journaling, #47 Single page, #50 cut up PL card, one page completed and posted = 19 pts. nylene, on "waitin on a woman" I love the simplicity and texture of those circle tags, and the colours are wonderful - you always choose great colours. The picture of Topher and his bowl is a howl. 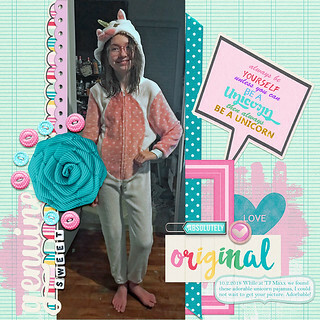 LisaDV, on unicorn, I adore your rainbows which don't overtake the layout, the black contrast parts, great LO! and "so much snow", the title alone is worth a zoom in, the whole thing contains textures and colours and INTEREST and I love the whole thing. angel97701 that is a great 2 page spread, I really appreciate that you used those wrestling illustrations - hard to get themed items like that on a layout without covering them up! @dasmith - "plan" is so lovely and soft and great clusters/embellies! 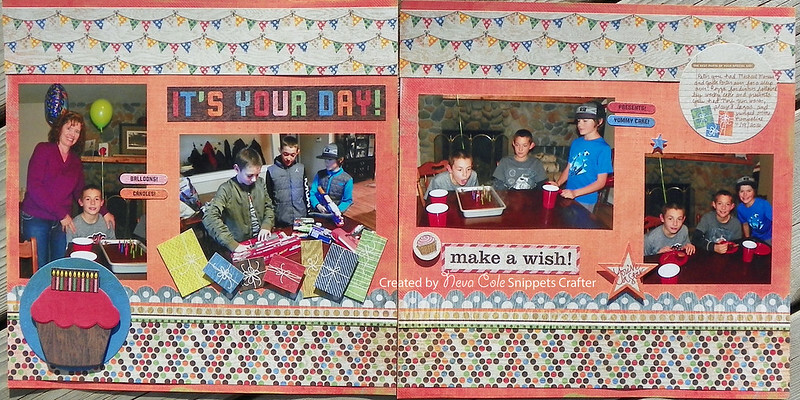 I'm quite pleased with this 2 pager - I love that the "take 5" challenge got me using ribbon and frames and circles. 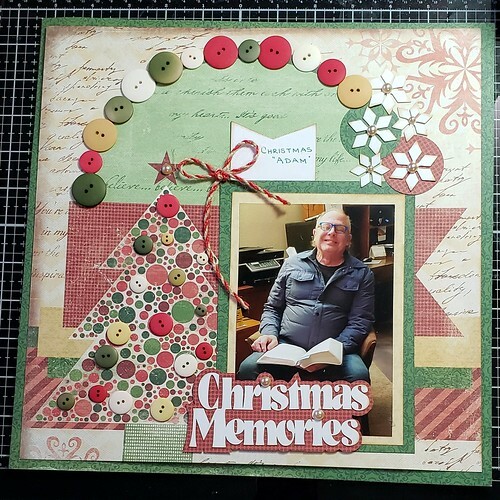 I love the sketch (challenge #7) that led to this layout, and the circular photos!